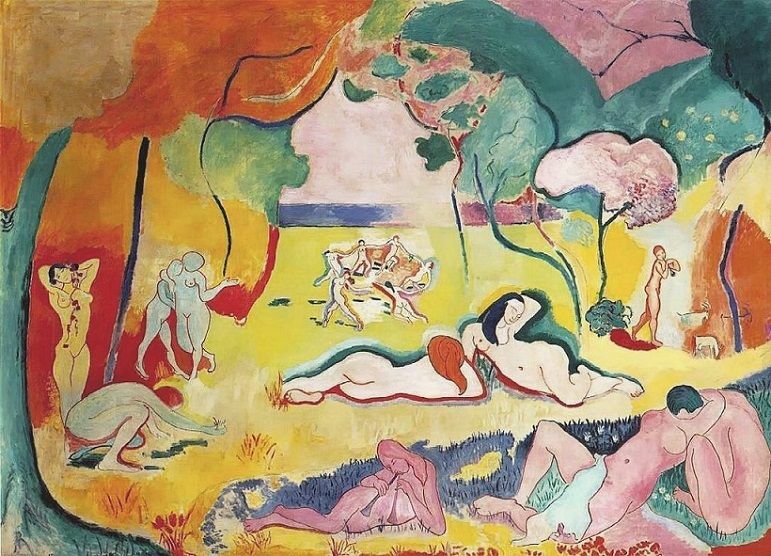 The below artworks are the most important in Fauvism - that both overview the major ideas of the movement, and highlight the greatest achievements by each artist in Fauvism. Don't forget to visit the artist overview pages of the artists that interest you. 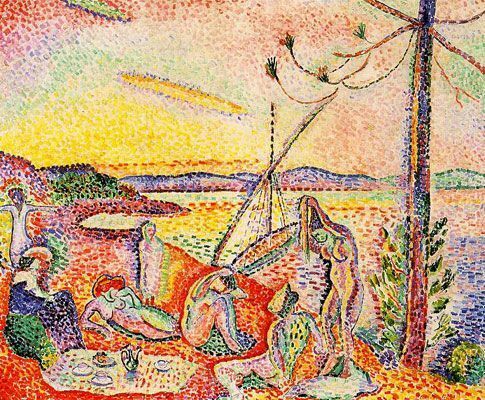 Artwork description & Analysis: This early work by Matisse clearly indicates the artist's stylistic influences, most notably Georges Seurat's Pointillism and Paul Signac's Divisionism, in the use of tiny dabs of color to create a visual frisson. What sets this work apart from these more rigid methods, however, is Matisse's intense concentrations of pure color. 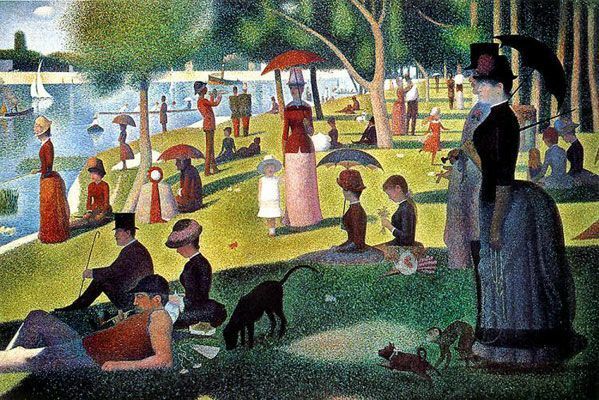 The oranges, yellows, greens, and other colors all maintain their own discrete places on the picture plane, never quite merging to form the harmonious tonality that both Seurat and Signac were known for, and instead heighten the almost vertiginous effect created by the striking dots of paint. Matisse took this work's title, which translates as "luxury, peace, and pleasure," from Charles Baudelaire's poem L'Invitation au Voyage (Invitation to a Voyage). Artwork description & Analysis: This scene depicts the portion of the Seine that runs through Chatou, the Paris suburb where de Vlaminck and Derain shared a studio beginning in 1901. 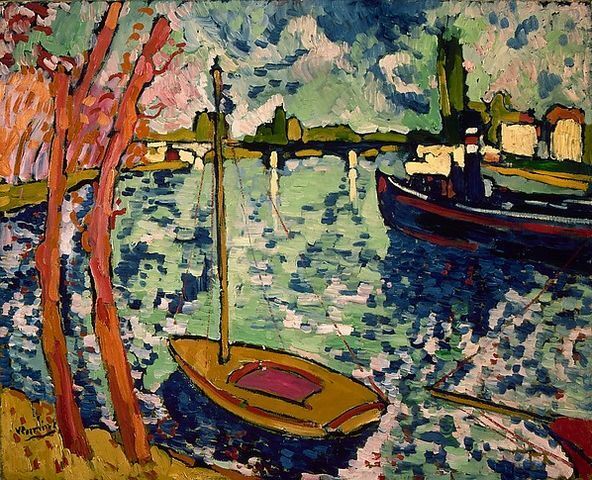 For The River Seine, de Vlaminck used impasto (a technique practiced by many Fauves): thick daubs of paint applied directly from the tube, then brushed together in short strokes to create the effect of movement. For the water and sky, de Vlaminck used a range of blues and greens, as well as dazzling white highlights applied in choppy dabs; the two red-and-orange trees at the left provide a lively contrast. The finished effect is one of brightness and vibrating motion; detail and traditional perspective matter far less than a sense of buoyant pleasure. As de Vlaminck said, "I try to paint with my heart and my guts without worrying about style." Artwork description & Analysis: Derain famously claimed to use "color as a means of expressing my emotion and not as a transcription of nature." 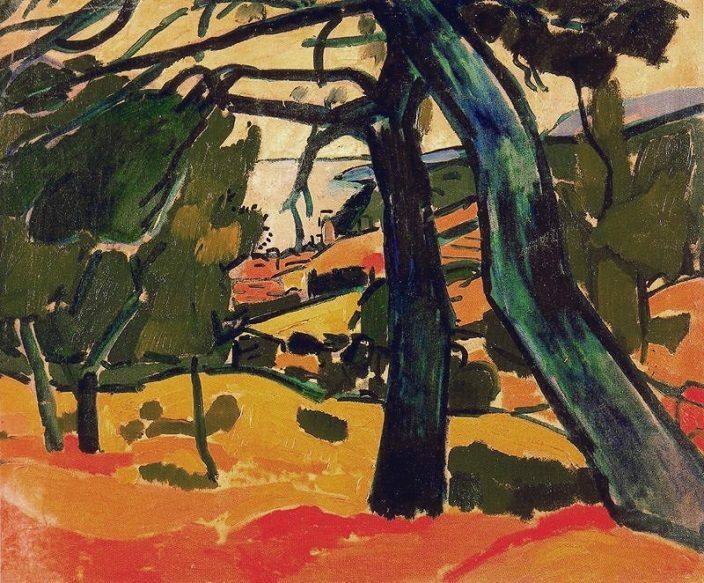 In this painting (just as in his famous Mountains at Collioure (1905)) Derain used long, isolated brushstrokes, influenced by Divisionist painting, to structure the trees and ground of his landscape. The colors are indeed non-representational, even unnatural: the trees' trunks are almost green, and the landscape is abstracted in patches of bright yellow and orange. The pulsing brushwork and jarring contrasts of these colors suggest the shimmering heat of a Mediterranean summer. By rejecting chiaroscuro and spatial depth, Derain keeps the viewer's attention fixed on this effect of light and on the life force that seems to ripple through every element of the landscape. Artwork description & Analysis: Derain painted this portrait of Matisse during the artists' shared summer in Collioure, when the two men were experimenting side-by-side in their work. As in most Fauvist portraiture, a detailed likeness of the subject was not the artist's goal. Derain's chief focus was to express a state of mind through the use of visible brushwork and fluid lines, both of which accentuated his applications of pure color. The sitter's right side is shadowed in violet and turquoise, and the left side of his face is highlighted in broad strokes of pink and red; this non-naturalistic use of saturated color underscores the figure's direct, intense gaze. While the background is painted in thin, vertical strokes, Matisse's head emerges more strongly in impasto brushwork, as if Derain were building it up from the paint itself, rather than through the traditional use of shading or perspective. 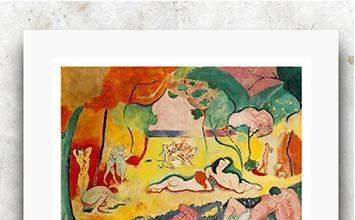 Artwork description & Analysis: The Joy of Life, possibly Matisse's best-known Fauvist work, was created in response to the negative critical reactions that followed Matisse's contributions to the 1905 Salon d'Automne. Although the subject of merry-making figures within a pastoral setting is a venerable one in Western art, Matisse's daring use of non-natural color to structure this enigmatic world, and his free delineation of its inhabitants, gave a fresh update to this imagery. Matisse's nudes perform activities of sensual bliss: dancing, making music, and embracing. They are connected to each other and to the vividly colored landscape by a sinuous network of curving lines and by the artist's radical use of the same pure colors for all the elements of his composition. Pairings of complementary colors (red and green, purple and yellow) produce strong visual contrasts that almost seem to vibrate, and the traditional means of suggesting depth and lighting have been eliminated. This idyllic scene unites thematic and visual influences from the Renaissance to Art Nouveau to Persian miniature painting, but it does so in a way that is undeniably modern. The Joy of Life was as influential as another large figurative canvas, Picasso's Les Demoiselles d'Avignon (1907), in its expressive reimagining of the human figure and its surroundings. Artwork description & Analysis: Following in the footsteps of Claude Monet and Eugene Boudin, Dufy painted numerous scenes of Le Havre, a port town located on France's northwestern coast. This view includes several docked ships against a background of local architecture. Although this imagery is largely naturalistic, Dufy's rejection of traditional perspective and his unconventional paint application are avant-garde. The abrupt diagonal line of the wharf at left, for example, has a destabilizing effect. The scene is painted in a stylized notation of quick brushstrokes: a scattering of small curved dabs for the waves, tiny blocks of color for the quayside buildings, and rough, abbreviated strokes for the forms of passing pedestrians. From the ship's mast at the center of the composition dances an array of nautical flags; each one is a small abstraction of color and shape. However, Dufy's apparently unpolished brushwork and the bare edges of the canvas do not detract from the work; instead, they evoke an overall mood of breeziness and gaiety. Artwork description & Analysis: Achille Émile Othon Friesz, a native of Le Havre, moved to Paris to study art in 1898 and became part of the circle that included Matisse, Rouault, Marquet, and Dufy. He frequently traveled in search of landscapes, and from 1906 to 1907 a trip to L'Estaque and La Ciotat in southern France with his friend Braque yielded several important Fauvist works. 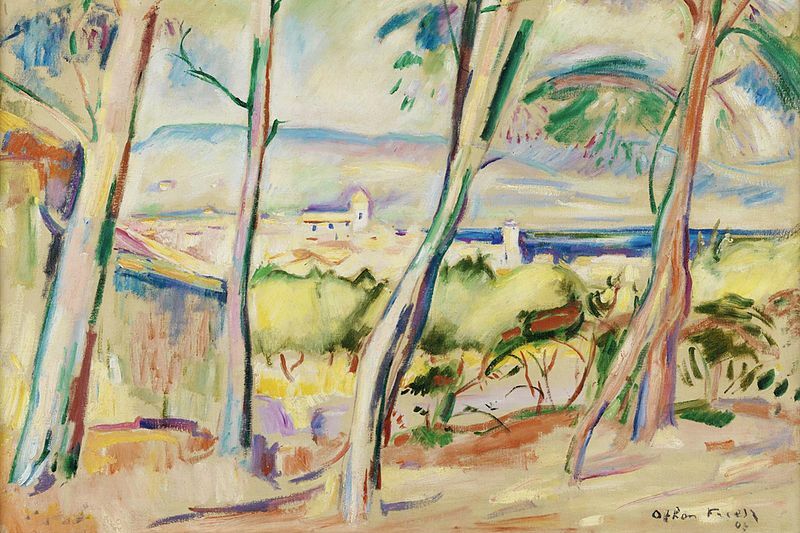 For this view of the town, Friesz used warm and light yellow tones which he accentuated by touches of green. Although he was a devoted Fauvist for as long as any of his contemporaries, Friesz's approach to the canvas was far more traditional, his color choices were more deliberate, and his application of paint was more methodical. In this sense, Friesz painted an Impressionist-style landscape using Fauvist color. Artwork description & Analysis: In the early stages of his career, newly inspired by a visit to the 1905 Salon d'Automne, Dufy painted several garden scenes inspired by his family's home in Le Havre. However, this is the only one from that period that contains a human figure. Like the Impressionists, Dufy was fond of painting gardens and flowers, but this scene of his family's garden, composed in a shallow, tightly cropped space, was a more expressive work of art. 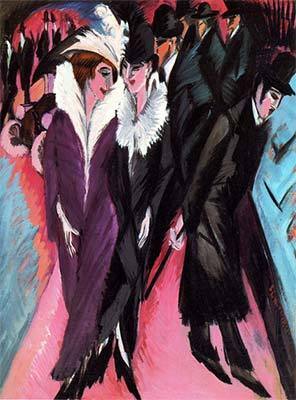 His ambiguous mingling of foreground and background through the curves of the foliage, his raw brushwork, and his non-naturalistic use of color (even in the skin of his model, his sister Jeanne) exemplify Fauvism's freedom from literal physical appearances and its new stress on color's intrinsic emotional power. Artwork description & Analysis: A student of Moreau and a friend of Matisse, Rouault brought a more somber, psychologically observant approach to his early Fauvist works like At the Circus. Although he shared the other Fauvists' use of impasto application and dense brushwork, he preferred darker colors that echoed his intense observation of human suffering. Like Édouard Manet and Honoré Daumier in the 19th century and his contemporary Pablo Picasso in the early-20th century, Rouault chose the subject of the circus performer. His clowns and acrobats, always shown offstage, reveal the inner pain and loneliness behind their colorful makeup. Rouault was criticized for focusing his attention on the wretched individuals at the margins of society (he also depicted prostitutes, wanderers, and physical laborers). His spiritual and artistic interests soon led him in a different direction than his fellow Fauvists: he began to paint more satirical scenes of societal inequality and the corrupt abuse of power. Artwork description & Analysis: Between 1905 and 1908, Braque painted the landscapes of L'Estaque (a setting also favored by Cézanne) in different color palettes. This 1908 composition reveals Braque's combination of Fauvist color and simplification of form with a nascent interest in volume and multiple perspective: the rounded arches of the ancient viaduct connect both sides of the landscape in the distance, but the foreground is a carefully arranged stack of boxy houses and vigorously brushed greenery. 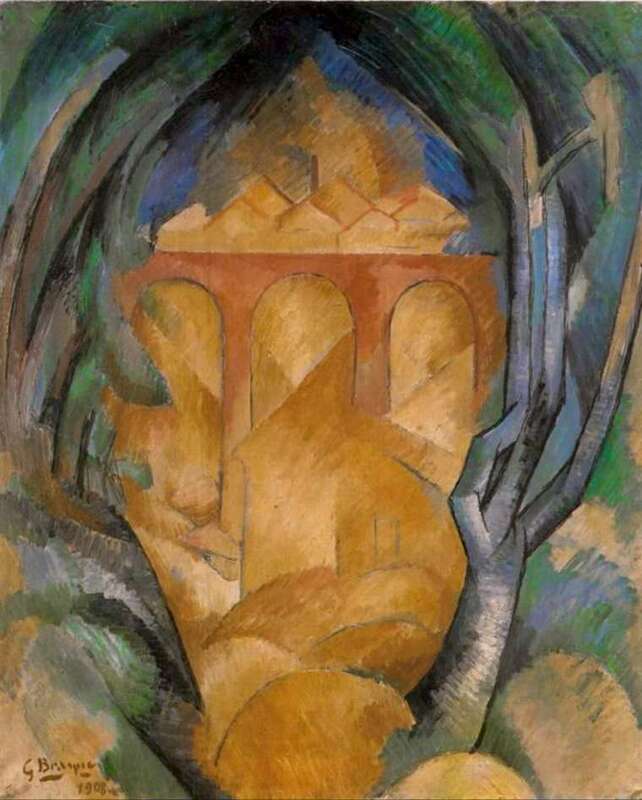 Le Viaduc a l'Estaque foreshadows Braque's future role in the development of Cubism, the next major modern movement of the 20th century. Artwork description & Analysis: Dance and its pendant Music were two of Matisse's late Fauvist works, the culmination of his work in this style. These large-scale canvases were commissioned by the Russian merchant Sergei Shchukin, a major patron of avant-garde art in that period. The arrangement of figures in a circular dance is a centuries-old motif, often used to suggest a golden age of harmony and leisure. 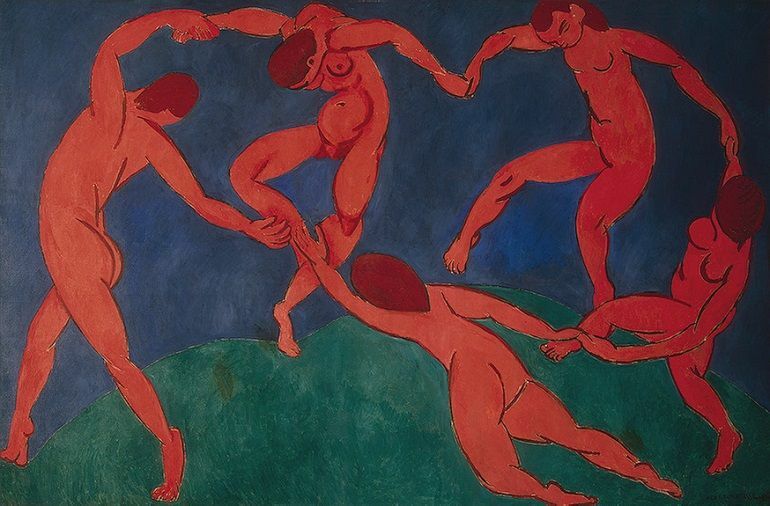 However, by simplifying and distorting his dancers' anatomy for expressive purposes, and painting them in a vibrant, non-naturalistic red against a flat ground of blue sky and green earth, Matisse emphasized the primordial aspect of dance. The figures' extremities brush the edges of the composition, as if their dynamism were barely contained by the canvas. When it was first exhibited publicly, at the Salon d'Automne of 1910, Dance puzzled and shocked the audience. 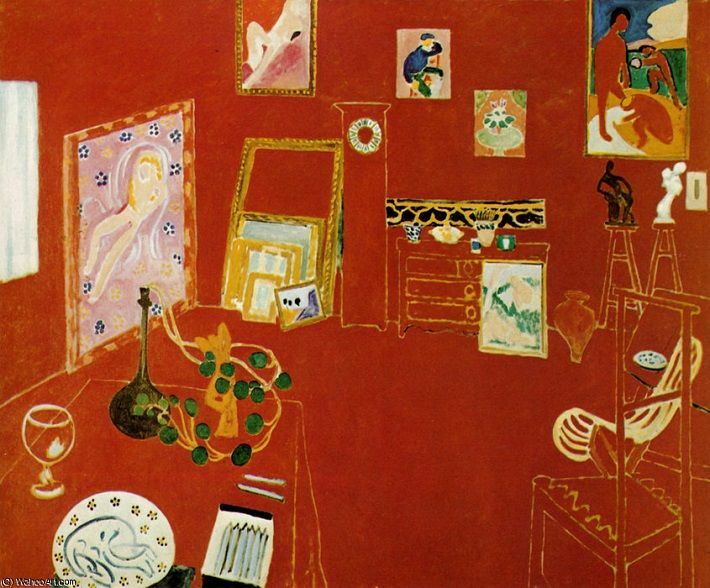 Artwork description & Analysis: In The Red Studio, Matisse dismantled the conventional distinctions between foreground and background, figure and space. Color and perspective are both non-naturalistic in this work: the canvas is one broad field of saturated crimson. When asked about this choice of color, Matisse commented, "Where I got the color red - to be sure, I just don't know. I find that all these things...only become what they are to me when I see them together with the color red." The delicate, pale outlines of furniture and walls are actually underpainting revealed from behind the red, and they are not consistent with any traditional perspectival system. Instead, space is flattened and exaggerated so that the viewer seems to be looking down into the studio from a raised vantage point. While this expressive use of color and space is Fauvist, the simplification of forms and static quality of The Red Studio point the way from Matisse's Fauvist phase to his growing interest in non-Western sources and his eventual association with the Ecole de Paris.